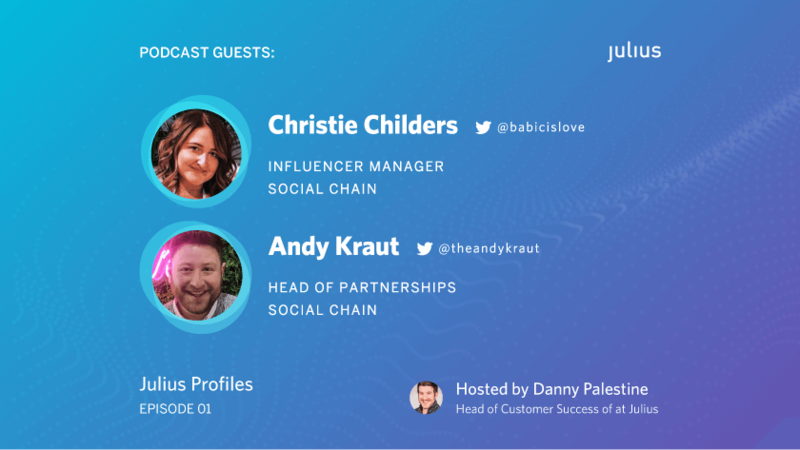 In the first episode of the brand new Julius Profiles podcast, we spoke to the wonderful Christie Childers and Andy Kraut from Social Chain about The Art of Personalization in influencer marketing. Christie is Social Chain’s USA Influencer Relationship Manager and Andy Kraut is their Head of Partnerships. Danny Palestine, our Head of Customer Success delved into the insights our guests have gleaned from their ground-level work with influencers. To Christie and Andy, personalization plays a huge role in managing the complex web of relationships between clients, influencers, and consumers. As for agents, however, personalization takes on a different form. After a discussion about fun activities to do with clients, including rooting for the blue knight at Medieval Times and learning about your coworkers at “Escape the Room” events, the conversation transitioned into putting in extra effort with a customer to let them know their business matters. “What we do is we have on-staff design teams to make sure that everything we send through is, tethered back to that cohesive strategy we originally presented, and then we also kind of try to show a little bit of love in each pitch,” said Andy. He followed up with an insightful quote regarding how personalization can separate you from the pack: “Here’s the thing, in a world where there’s a million influencer tools and a million agencies, you can’t always be the biggest but you can care the most.“ And caring, according to Andy, is the best way to manage your relationships. From there, the conversation shifted towards finding the right influencer for a client. Danny asked Andy and Christie how they can be sure an influencer not only meets requirements like reach and engagement rates, but also fits a brand’s tone of voice and audience. Getting to know an influencer, according to Christie, takes doing your due diligence, like diving deep into their content. And when you get to know an influencer, it’s important you don’t compromise their voice or personality. When sending briefs to influencers, Christie does her best to respect their creativity while giving her client what they want. Danny then asked the other side of his original question: What happens when you realize you lack total control over the production of influencer content? The implication being, that giving an influencer, who is a person before anything else, room to create means you don’t necessarily know what outcome will be. Danny shifted gears, inquiring about influencers and their relationships with consumers. He shared a quote by Obele Brown-West, Executive Vice President at Weber Shandwick, which discussed the unique opportunity that social media gives marketers to have authentic, one-to-one conversations with their consumers. On this notion, Danny asked, how are brands using social media and technology to have these conversations with their consumers, especially direct-to-consumer brands? Christie took the conversation in a different direction, intimating that she uses sponsored posts for market research: “Something I really enjoy doing is going back to your sponsored posts and really looking through the comments... seeing what people are saying about your products, how they are responding to them.” She suggested that community managers can even use this information to connect with people who didn’t like an ad or a product. Piggybacking off this insight, Danny asked what Andy and Christie thought about developing long-term relationships with influencers so they can be seen as more than just amplification and targeting tools. After a brief conversation on picking the right influencer from a batch or roster, Danny wrapped up the conversation by asking Andy and Christie about their professional “New Year’s Resolutions” to help improve their relationships with their clients. Christie remarked that she’d like to send more personal gifts and letters, while Andy said he’ll continue to engage in active listening with both his influencers and his clients so he can continue to deliver great work. All in all, Christie and Andy offered some unparalleled insights into their unique roles in the world of influencer marketing. Behind every influencer post, vlog, or experience, is a team of people like Christie and Andy who work tirelessly to deliver high-quality content that captures an influencer’s creative energy while meeting a brand’s needs. Ultimately, the lynchpin in a successful influencer marketing campaign is the positive respectful relationship between brand, influencer, and consumer.